When Jia Zhangke made his 1997 feature debut, Xiao Wu, he was rebelling against decades of tradition that had drawn a hard line between cinema and reality. Chinese film history is rooted in genres found in classical theater and literature, like wuxia and fantasy, and the industry’s reliance on artifice was only heightened by the Cultural Revolution, a period when filmmaking was viewed as a tool of the Communist regime. Jia’s raw, groundbreaking depiction of petty crime, small-town malaise, and economic degradation made him a controversial figure, and his early work was banned by the authorities. Two decades later, though, he stands as the nation’s leading art-house auteur, with an international influence that can be felt in at least two generations of directors who have turned their cameras on some of the most urgent social issues of the day. In anticipation of the Stateside release of his latest, Ash Is Purest White, Jia paid a visit to the Criterion office, where he shared with us some reflections on one of his favorite films, Vittorio De Sica’s Bicycle Thieves, and what one particular scene taught him about the power of movies to capture the joy and pain of everyday life amid seismic change. The following text is drawn from excerpts of an interview, translated from the Mandarin by Andrew Chan. Special thanks to Vincent Tzu-Wen Cheng. 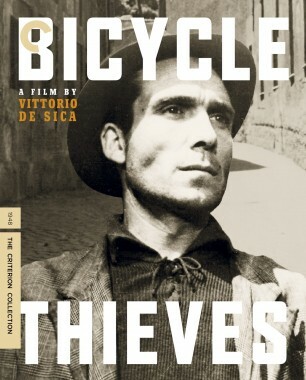 The first time I saw Bicycle Thieves was in the late seventies, when I was around ten years old. The Cultural Revolution had just ended, and the government was digging up a lot of old movies from before the Revolution to show the public. There were three cinemas near where I lived in Fenyang, and my mother had worked at one of them, so the employees there would let me in. Bicycle Thieves was one of the movies I saw, and it left a deep impression on me. What it showed us of life in postwar Italy seemed so similar to what we were going through on the other side of the world. 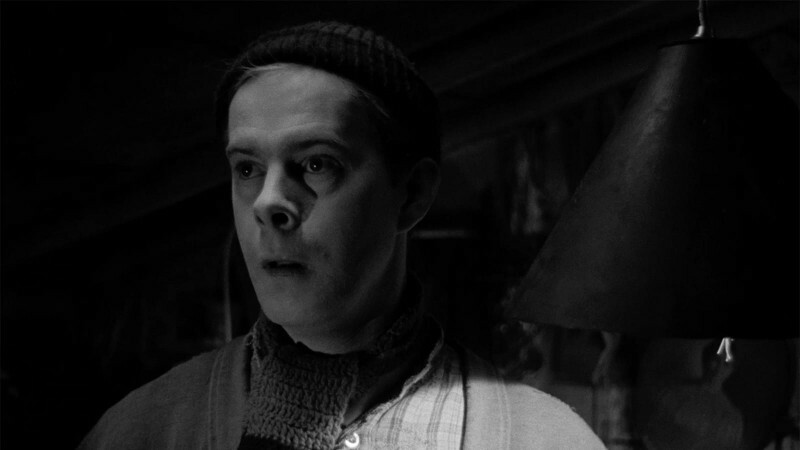 Even though the foreigners had bigger noses than we did, the film looked like it might as well have been shot in my hometown. That kind of poverty was familiar to me; there was nothing about it that needed to be explained. Years later, I saw it again in college, in a class where we were learning about film theory and world cinema history. 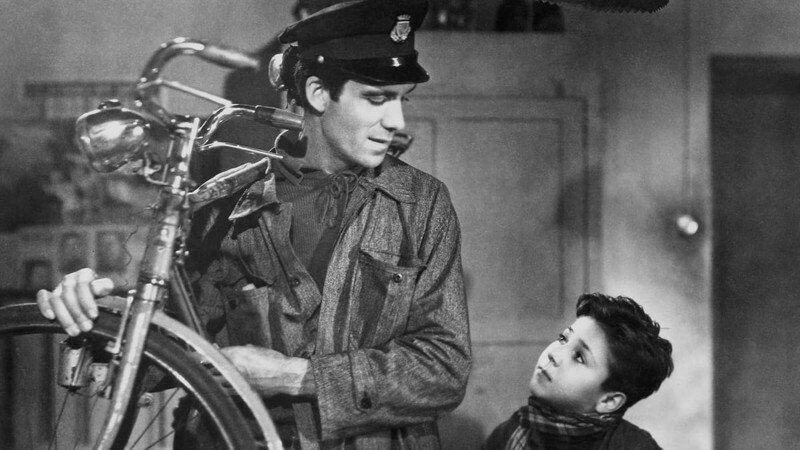 We were mainly looking at Bicycle Thieves as a model of leftist social criticism. But I was particularly struck by how extraordinary it was just on a visual level. I even wrote in my notebook at the time about how De Sica used changes in the weather, and the turning of day into night, as a kind of organizing principle, to give the audience a tactile feeling of being in that place with those characters. Cinema can so easily become an overpowering, coercive medium, with the director positioning himself as a god, leading the audience to predetermined conclusions. But in Bicycle Thieves, you don’t feel like you’re being controlled. Instead, you feel like you’re part of an experience. Watching De Sica’s movies helped me see the relationship between cinema and reality in a whole new light. To understand this, you have to go back to what the movies meant to Chinese people at that time. There was a deep-rooted tradition of adapting theater to the screen—the very first Chinese movie ever made, The Battle of Mount Dingjun (1905), is an example of that. From the beginning, we were taught to expect that every movie would have a strong theatrical element and that the world on-screen was completely separate from reality. But by the time I started studying film in the 1990s, Chinese filmmakers were trying to figure out how to capture reality. You’d think that would be such a simple thing to do, but in fact it was a big leap for us. At the time, we only had commercial movies, including Hong Kong cinema, and propaganda. The Italian neorealists gave many of us the inspiration to turn our cameras to real people and experiences. We found ourselves borrowing a lot of their methods—on-location shooting, the use of nonprofessional actors, open-ended narratives—to construct a sense of the real. As the years go by, I forget the details of the movie, but I will always remember the scene where the father and son share a meal. It’s after they’ve been disappointed by their failure to find the stolen bike. The father realizes his son is heartbroken and takes him out to eat. The moment the scene begins, we can see he’s chosen a nice restaurant and that the customers inside are from a different background from the two protagonists. There’s an immediate contrast being struck between the working class and the upper class. On the one hand, you feel the father’s desire for his son to enjoy life’s most basic pleasures. You know he wouldn’t have entered this restaurant on his own, if he were thinking purely rationally. It’s an act of love. But at the same time, there’s a feeling of rage running through this scene. Why can’t they be like the other customers? Why can’t they live this life? They’ve penetrated this other world that their economic situation has kept hidden from them. Once they’ve ordered their food, there’s a bit of cross-cutting where you see a young boy at another table, and his nice clothes and obvious ease in this environment separate him from the father and son. 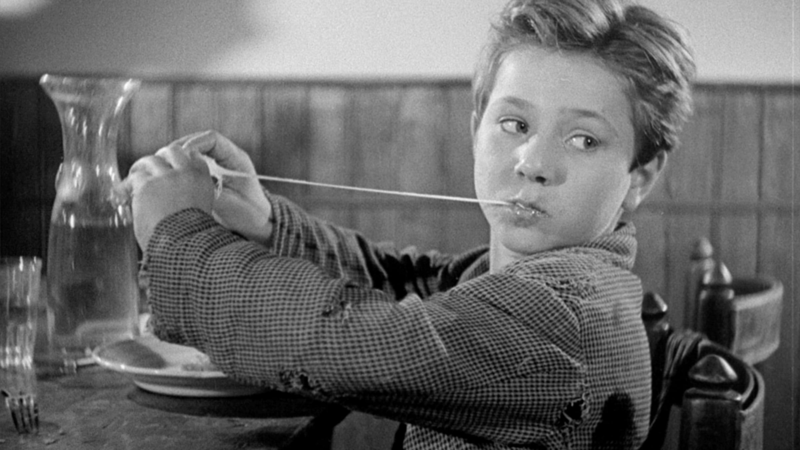 But you can see, as the working-class boy eats the cheese, that the pleasures of the food are helping him temporarily forget his troubles. There’s a sweetness here but also a real rebelliousness. 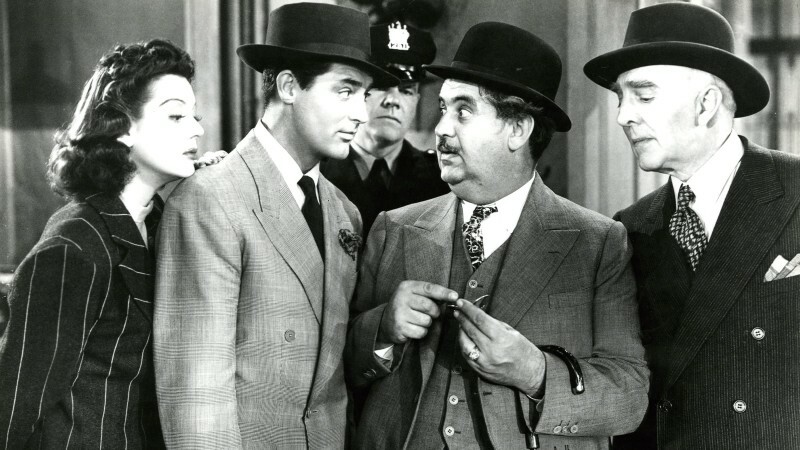 There’s a similar dynamic in my film Ash Is Purest White, in a scene where the female protagonist is an interloper at a fancy restaurant, not unlike the father and son are in Bicycle Thieves. She’s lost all her money, and she’s trying to scam men by using their weakness of philandering against them. 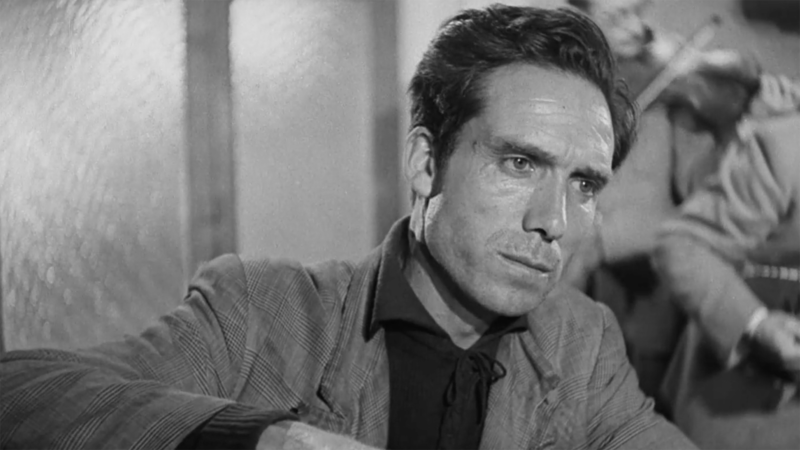 But it’s not just the class commentary in Bicycle Thieves that stands out to me. I also really love how De Sica uses his actors. In that scene, the young boy doesn’t say much, but in his expressions you can see what’s going on in his mind, even on a subconscious level—his excitement and anxiety, as well as the precociousness of a child who has had to grow up very fast. There’s a complexity to the gazes he exchanges with the wealthier boy at the other table. De Sica is in such control of this enclosed space that it almost feels more open than it is. You’re circulating among a number of different parties—there’s the father and son, but also the neighboring table, the waiter, and a band of musicians playing in the background. It’s so different from filmmaking today, which has a tendency to draw our attention exclusively to the lead actors, causing us to neglect the world around them. The way these nonprofessional actors brought their own body language, their own way of being, to the film was a revelation to me. They don’t look like tourists who have stumbled into the world of the poor; they’re an integral and natural part of the setting. Though De Sica’s influence in Chinese cinema actually stretches back to the Fourth Generation, with directors like Xie Fei and Wu Tianming, this approach to acting and on-location shooting was particularly inspiring to Chinese filmmakers in the 1990s. Not only were most of the scenarios at that time so distant from reality, but the settings were artificial as well. 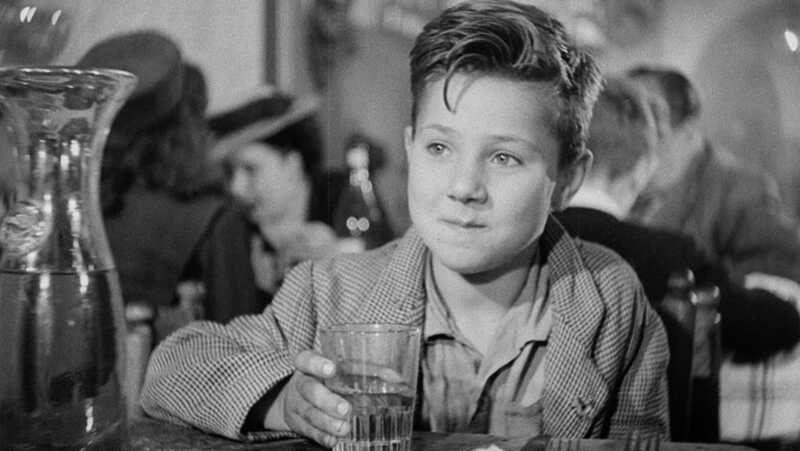 Neorealism showed us how nonprofessional actors could bring traces of their lives into a movie and become a central ingredient in creating a certain texture of reality. There are some memories I have of childhood that make this scene especially powerful for me. When I was young, my father was a middle-school English teacher, and his pay was very low. We didn’t have much to eat, let alone anything very good, and there were times when we couldn’t get full. China had a planned economy, and all we had to eat were rations. Even something as simple as eating dumplings was a rare occasion—we only ate them during Chinese New Year and the Mid-Autumn Festival. Of course people’s bodies are different, so some were able to get by, while others constantly felt like they were starving. But my father would take me to the annual festivities at the local temple, and we’d eat my favorite dish, guo you rou, a pork specialty in Shanxi. I still remember that; it was the best thing I’d ever tasted. I think about this when I watch that scene in Bicycle Thieves. There’s something beautiful about a father and son experiencing together the most basic joys of life: eating until you’re full, eating well. Even though war and poverty are tragedies you would never wish on anyone, the scarcity they create can teach you a lot about the human condition. And this is a scene that probably only someone who has lived under those conditions could have written. 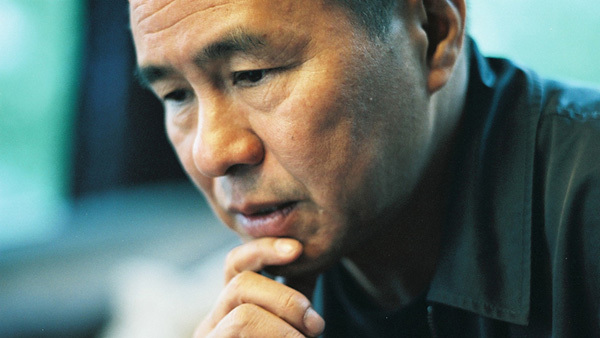 Taiwanese filmmaker Hou Hsiao-hsien is back with an awe-inspiring martial-arts epic. Bicycle Thieves is truly one of my favorite films. I could watch it over and over again, and in truth, I have. Jia Zhangke is the director of Xiao Wu, Platform, Unknown Pleasures, and several other films. 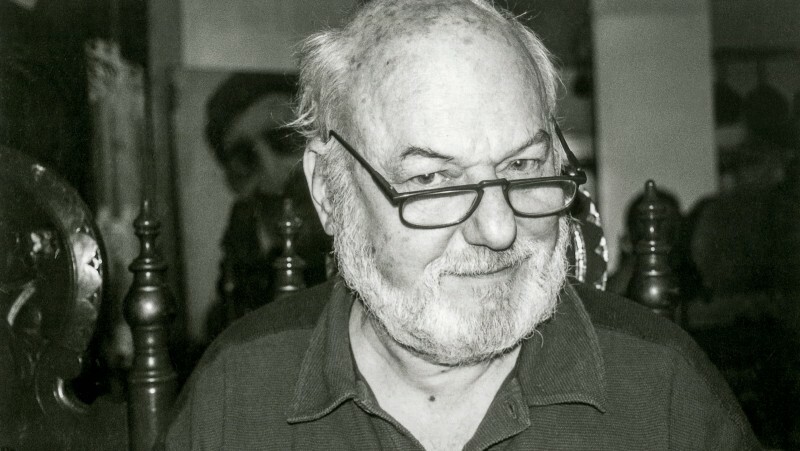 His 2006 film Still Life won the Golden Lion at the Venice Film Festival.